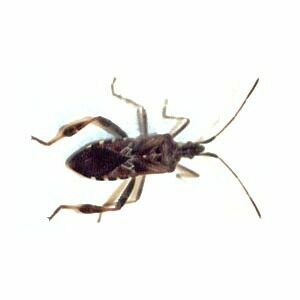 The western conifer seed bug, or “Stinkbug”, has become a nuisance pest. The bug has the habit of entering buildings at the onset of cold weather in the late summer or early fall as it seeks a protected site to spend the winter. Stinkbugs do not bite or sting, or cause damage to the home. They will, however, give off a pungent odor if you handle them, which is part of the insect’s defensive strategy. They also may make a buzzing sound when flying. In spring, Stinkbugs move outside to coniferous trees nearby. The Stinkbugs feed on the developing seeds and early flowers of different species of conifers. Females are reported to lay rows of eggs on needles of the host trees, which hatch in about 10 days. Young nymphs then begin to feed on tender cone scales and sometimes the needles. The nymphs are orange and brown, becoming reddish-brown to brown as they develop. Nymphs pass through five stages and reach adulthood by late August. Adults feed on ripening conifer seeds until they seek overwintering quarters. Are Stinkbugs Native to New York? The range of the western conifer seed bug or Stinkbug has been expanding. In 1992 , reports of Stinkbugs from western New York State started. Stinkbugs are now found throughout the state. How Do I Get Rid of Stinkbugs? If you have a Stinkbug problem, contact Nature’s Way exterminators in New York & Vermont, by calling (518) 745-5958 or (802) 855-2978. Since 2001, our focus has been on providing top quality pest control services at the best rate. We provide FREE Inspections and use the most environmentally friendly products available for natural pest control and Stinkbug extermination.